Today is holi, a great festival of joy and fun, to display the colours of life. It is celebrated across the country among the young and old alike. 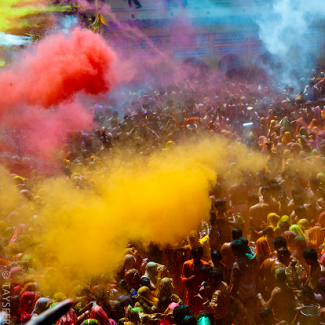 Emotions run high, fun reaches a new peak when with music, dance and love we pour colour on each other and celebrate. The origin of this festival one may not be sure of, but what one is sure of is that it is a spring festival, a harvest festival, a festival to make friendship, forget old enmities and misunderstandings. Young boys and girls give promises to each other to barge upon new lives. A few lines on its significance will have relevance here to appreciate higher values of life that lie hidden behind such celebrations. It is played in Brindavan among Krishna and Radha along with all other gopikas, all young and ravishingly beautiful. Colours basically mean beginning of new life. There is another story where the demon king Hiranyakashyapu wished to be worshipped and wished to be immortal. He developed enmity with Lord Vishnu, whereas his little son Prahlad was a devotee of the Lord. Blinded by ego and love for power, the demon king ordered his sister Holika, who had the power to burn any, to burn the kid. Holoka put the little one on her lap, but to every one’s surprise got herself burnt. Lesson – innocence and devotion can’t be burnt, can’t be killed whereas ego, lust, greed and evil designs do get destroyed. My holi started with a lovely message from Hanna, an assistant professor in IT followed by Saima, a young journalist, besides messages from many friends across the country with intimate and humorous messages. With this I wish to emphasize that many of our festivals in India are celebrated with fun and gusto cutting across the faiths. We express our love, our respect, our friendship and national character – Jo mera hai woh tera, jot tera hai woh mera approach in our day to day life! It is my firm belief that colour without love is mere dust, and dust with love has all the colours. On this lovely occasion let us greet each other and complete our noble duty in this divine Creation! M pretty sure u must be doin really gud. Read ur article,those are really nice n vibrant n inspirational.